I am not Vegan but I am more and more concerned about the Dairy industry and the cruelty afforded to animals for milk and eggs. I hold my hands up i have a bit of a cheese addiction and wish I didn’t but anyway I am trying to introduce more Vegan food into my diet. 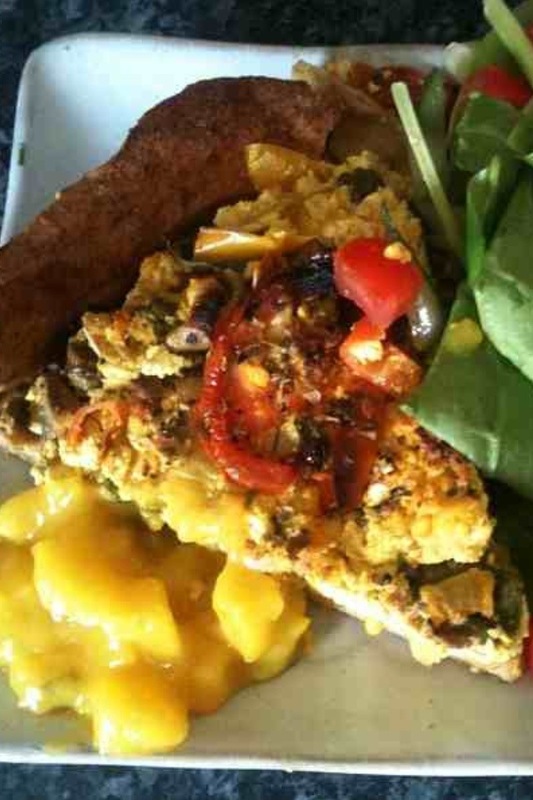 This quiche is great made with Tofu as the ‘egg’ colored with a touch of tumeric for a yellow colour. I added too much so it really looks yellow but hey ho. I am waiting to try this on my wonderspouse to see if he guesses its Vegan. Roll out pastry and bake blind. I used spelt flour and mixed in some pumkin seeds for some extra nutrition. mash up the tofu and mix in the tumeric for colour. Mix all of the other ingredients together with the Tofu and fill the pastry case, layer on the tomatoes and season. Veggie Sausage, Mushroom and Caramalised Onion Puff. 1 Pkt Veggie sausages cut into 8 pieces. 3 good pinches of Fennel seeds. Gently brown the sausage slices, as they begin to brown add the sliced mushrooms and onion, cook until the onions are soft and jammy and the mushrooms take on a meaty texture. once cooked add the fennel seeds salt and pepper and switch the heat off, let the mixture cool and rest. Roll out the puff pastry, into a square shape then add the mixture and spread over the pastry leaving a 1 cm gap around the edges for the pastry to puff around and encase the puff. Cook in the oven and serve. We enjoyed ours with some sliced potatoes baked in soy cream and garlic, but you could serve with a green salad or some slices of ripe Beef Tomatoes. The great thing about this is that it is easily Veganised with the use of a good Vegan Sausage such as Linda McCartney and in my opinion i have always preferred Puff Pastry which has no butter which is readily availiable. The addition of Fennel Seeds is optional,but give it a try it really enhances all of the flavours and brings them together. I had a leftover for my lunch today with a splodge of piccalli.